If the basic principles of the Agile Manifesto and the Scrum framework are simple managing global Agile software development projects in the corporate world is sometimes more complex and complicated. This article lists some approaches that have been created to answers the specific questions raised by scaling Agile practices in large organizations. Scaling Agile could be a challenging journey. Graig Larman and Bas Vodde, the authors of the LeSS approach, wrote in their first book “After working for some years in the domain of large, multisite, and offshore development, we have distilled our experience and advice down to the following: Don’t do it”. In fact, some people argue that you should not try to scale up Agile, but rather learn how to scale down your projects. This is however not the way many large multinational organizations work when they want to develop quickly large software products with multiple teams that could be distributed over distant location. As the vision of the product and the number of people involved in the project get bigger, these projects needed specific practices to manage them. From the simple initial idea of Scrum of Scrums to the extension of user stories in features and epics and the integration of sprints in a releases agenda, the Agile project management world has added new concepts to the initial Scrum and Kanban frameworks. This has lead to the creation of new frameworks and approaches, often trademarked and registered by consulting companies selling services and certifications, that could be used by larger corporations. This article provides a short presentation of the main results of these efforts and points you to references where you could explore them more deeply. The following Agile Scaling approaches are presented here in alphabetical order: Disciplined Agile Delivery (DAD), Enterprise Scrum, Fast Agile, Large Scale Scrum (LeSS), Nexus, Scaled Agile Framework (SAFe, ScALeD Agile Lean Development. 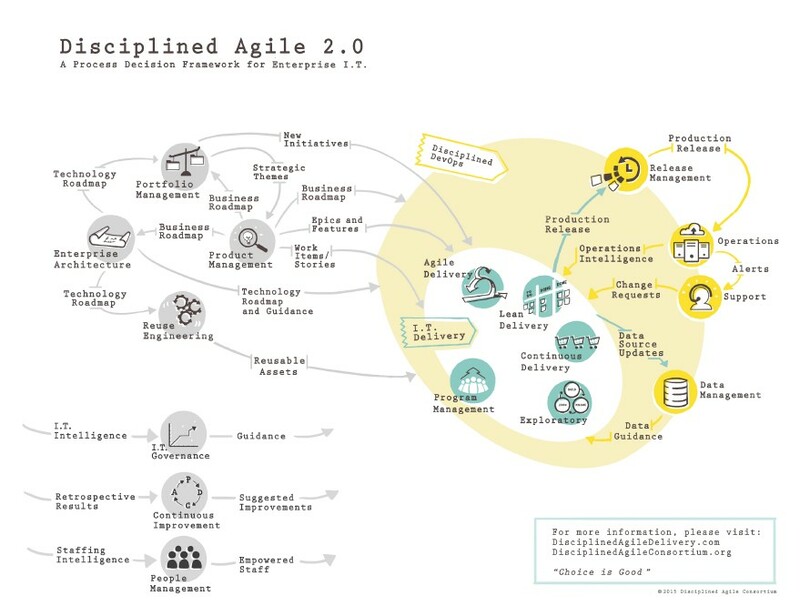 Disciplined Agile defines itself as “a process decision framework for Enterprise I.T. The main characteristics of this framework are that it: is a people-first, learning-oriented hybrid agile approach; has a risk-value delivery lifecycle; is goal-driven; is enterprise aware; is tactically scalable at the team level; and scalable strategically across all of IT.” DAD was developed by Scott Ambler and Mark Lines. DAD considers itself as an hybrid approach. It extends Scrum with elements from other approaches like Extreme Programming (XP), Unified Process (UP) or Kanban and Lean software development. It adds an Architecture Owner to the Scrum Roles and uses secondary roles like the Independent Tester. It claims to be more flexible and easier to scale than other Agile methods due to its goal-driven approach that allows to avoid being prescriptive like Scrum. An another key point of DAD is its risk-value lifecycle where the riskier work is done first to increase the chance of project success. Enterprise Scrum defined itself as “a business-oriented, scalable, general empirical management and execution framework. It can help manage with more agility any business process including company management, strategy, marketing, sales, product development, software development, basic research, compliance management, business process redesign, entrepeneurship and start-ups, etc.” Enterprise Scrum was created by Mike Beedle. 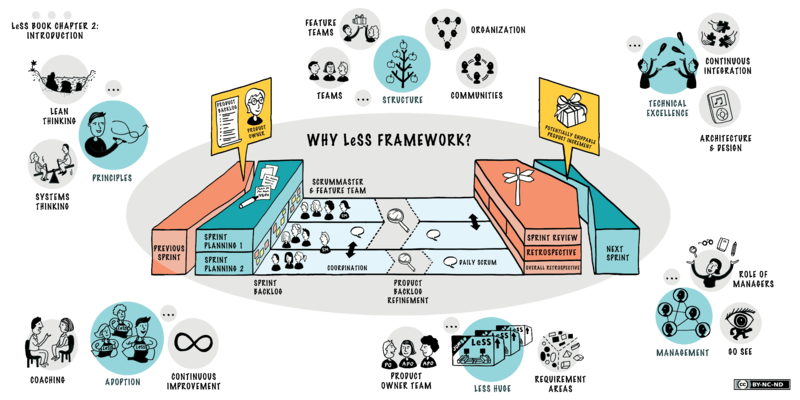 FAST Agile defines itself as ” a lightweight and simple framework that can scale to produce software at volume better than anything on the planet today! FAST Agile is a new approach to organizing work, organizing people and also a collaboration model. FAST combines elements of Scrum, Extreme Programming (XP), Story Mapping and Open Space Technology (OST) in a way that has never been done before with the goal of high bandwidth and high-quality software in short iterations.” FAST Agile as created by Ron Quartel. Large-Scale Scrum (LeSS) defines itself as “Scrum applied to many teams working together on one product. Why LeSS? Similar to one-team Scrum and just like one-team Scrum, LeSS is (1) lightweight, (2) simple to understand, and (3) difficult to master – due to essential complexity. For large groups, LeSS hits a sweet-spot balance between defined concrete elements and empirical process control. It is not “new and improved Scrum.” Rather, LeSS is about figuring out how to apply the principles, elements, and purpose of Scrum in a large-scale context. “. LeSS was created by Craig Larman and Bas Vodde. Large-Scale Scrum (LeSS) is based on the following principles. Large-Scale Scrum has two frameworks: LeSS for products developed with 2 to 8 teams and LeSS Huge for products developed with 8 or more teams, up to a few thousand people per product. Nexus defines itself as “a framework that drives to the heart of scaling: cross-team dependencies and integration issues. It is an exoskeleton that rests on top of multiple Scrum Teams who work together to create an Integrated Increment. It builds on the Scrum framework and values. The result can be an effective development group of up to 100 people. For larger initiatives, there is Nexus+, a unification of more than one Nexus.” Nexus was developed by Ken Schwaber. Nexus is built on the existing Scrum framework and values. It keeps the basic principles of Scrum with added integration and coordination activities above the individual teams. The goal is to maximize the outcome with a minimal coordination overhead. One “Done” integrated increment at least should be delivered for every Sprint. 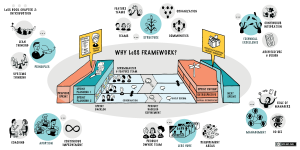 Scaled Agile Framework (SAFe) defines itself as “an online, freely revealed knowledge base of proven success patterns for implementing Lean-Agile software and systems development at enterprise scale. 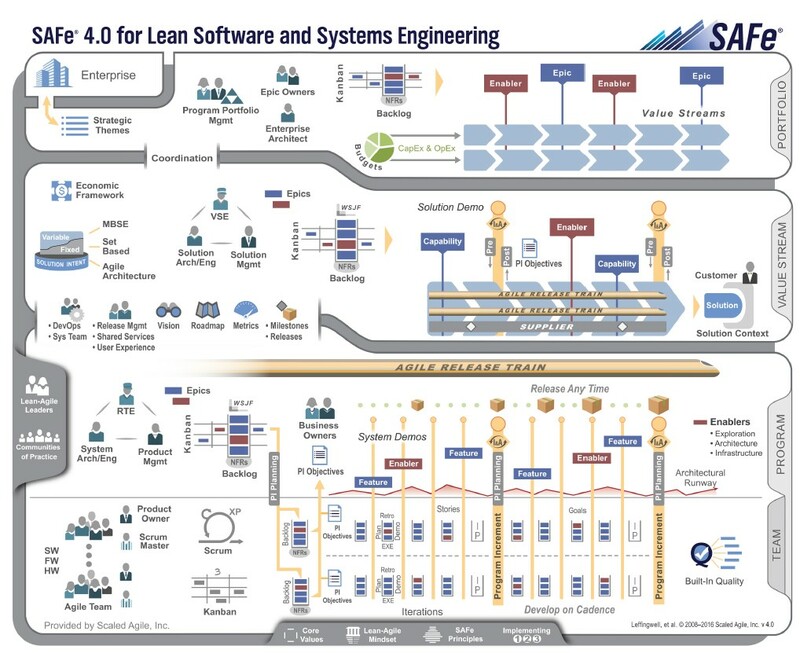 It provides comprehensive guidance for work at the enterprise Portfolio, Value Stream, Program, and Team levels.” Developed by Dean Leffingwell, the Scaled Agile Framework (SAFe) is certainly the most known Agile Scaling approaches. The SAFe approach provides separate recommendations to apply Agile at the team, program and portfolio levels. Based on Leffingwell’s work on Agile requirements, one of the main concepts of SAFe is the Agile Release Train (ART) that is its primary concept for delivering value. Each ART is a self-organizing group of teams that works together based on a common backlog. The Agile Release Train is stewarded by specific roles like the Release Train Engineer that act as the train ScrumMaster. Other activities like product management, DevOps or UX design are also performed at the train level. 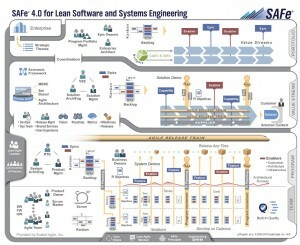 ScALeD Agile Lean Development was developed (originally in German) by Christoph Mathis, Markus Gärtner, Stefan Roock, Andreas Schliep and Peter Beck. 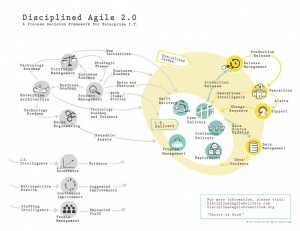 They believe that no new methods or additional frameworks are required to successfully scale Agile practices, but rather a set of guiding principles. The principles of ScALeD are based on excited customers, happy and productive employees, global optimization, supportive leadership and continuous improvement.